Police are looking for a man they say attacked his girlfriend, set her New York apartment on fire and then hit a police officer responding to the scene with his pickup truck on Christmas morning. Manuel DeLeon Cuellar is on the lam after the break-in, assault, arson and hit-and-run at his girlfriend's central Long Island apartment on Westwood Drive in Brentwood at about 2 a.m. Thursday, according to the Suffolk County Police Department. 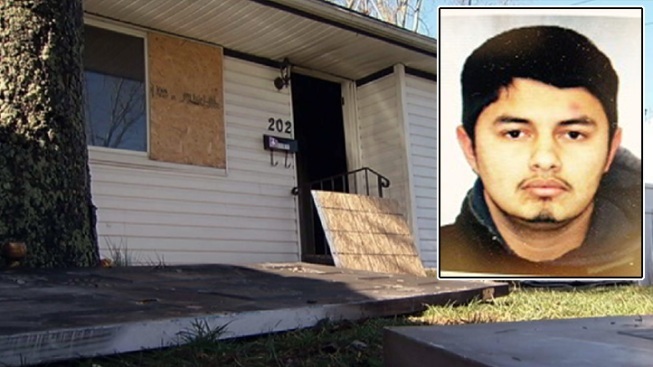 Cuellar, 24, is accused of breaking into his girlfriend's apartment, attacking her and then setting the home on fire. When police responded to the scene, Cuellar allegedly hit an officer with his Chevrolet pickup truck and fled the scene. He crashed the vehicle a short distance away, police say, and ran away. Cuellar's girlfriend both sustained minor injuries. Both the girlfriend and a family living in an adjacent apartment were forced out of their homes because of damage done during the fire. Cuellar, of Jamesport, is described as being Hispanic and is about 5 feet, 9 inches tall with black hair and a beard. He weighs about 175 pounds. Police say he is possibly armed with a knife. Anyone with information about the man's whereabouts is asked to call Crime Stoppers at 1-800-220-TIPS. -- Marc Santia contributed to this report.